Porsche 718 Boxster … The elephant in the middle. You have to feel sorry for Porsche sometimes. Like all good companies, they are successful because they do not sit on their laurels, but constantly keep their products up to date in a fiercely competitive market place. Yet their supposedly staunchest fans would have them endlessly reliving some rose tinted version of history, hamstrung by their own past glories. It is 20 years since they moved on from the old air-cooled engines, but the die-hards won’t let it drop. Their world beating range of SUV’s and saloon cars have been the financial saviour of the company, but the purists still mutter about sports cars with the engine in the wrong place. And now there is a new abomination for the luddites to moan about … they have dropped the flat 6 engine from the Boxster and replaced it with a flat 4! 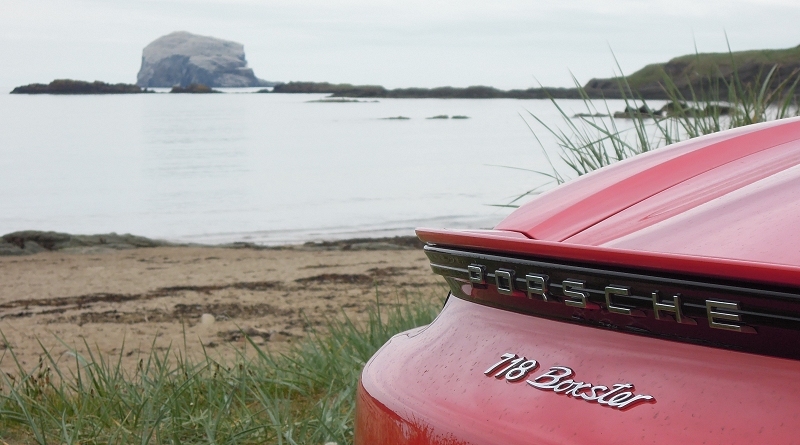 I decided to drive the new 718 Boxster, as it has been re-branded, with a totally dispassionate eye, and with none of the sepia memories of old Porsches gone by … but there is a problem. I have a 50 mile drive to Edinburgh to pick up the car, and I’m in my original Cayman, with of course a version of the 6 cylinder engine that has been replaced. I haven’t driven the car for a few months, and it is running superbly. Hardly a fast journey through the seemingly now permanent traffic round the Edinburgh by-pass, but the little 2.7 engine is still a joy to use, and even nearly ten years old now, the Cayman is as bright and vibrant to drive as it ever was. Oh dear, where is my objectivity? My test car for the day is a basic model, not the hotter S, and as ever it is dripping with luxury extras, but at least it’s God’s own colour, Guards Red. I take this as a good sign, although I loath the black wheels. Everything else bar the engine is what you’d expect from a refresh; tweaked styling, improved chassis and steering, better electronics, and all told they have done a splendid job, but it is all overshadowed by the elephant in the room. My car has the new turbo charged 2.0 litre flat 4 which is pumping out 300 bhp, and that’s a whopping 150 bhp per litre. By rights it should be peaky and temperamental, but the complete opposite is the case. This engine is a torque monster, and it pulls strongly from almost zero revs with not a hint of turbo lag. I still don’t like auto gearboxes in sports cars, but at last the long legged PDK box has found a compatible dance partner in this firecracker of an engine. I cruise down to North Berwick for lunch, and from the very get go, I really like this new car. As far as I can tell it doesn’t have the stupid juvenile sports exhaust, and it makes a soft, deep burbling note which hardens as you apply the beans. OK, it doesn’t sound like a 6, but it is still a very characterful note. The real point is though that such is the torque spread that it makes very rapid progress very easily in a most relaxed fashion. There is no need to get it “on the cam” and it feels a more mature car as a result, very much the sort of car you could happily use every day. The handling is pin sharp, the brakes are great, the new styling really works for me, the ergonomics and controls are perfect; in short it is without doubt the best sports car in its class, by a country mile. Porsche have achieved the triple whammy of more power with less emissions and better fuel consumption. Let’s not forget that the whole Porsche legend started with a flat 4 engine in the now revered 356, so can we please get over the hand wringing and let’s just enjoy another sensational sports car from Porsche. I return the car and set off home in my Cayman. Compared with the new car, you can clearly feel the 10 years of extra development. My car feels much simpler, more analogue to drive, but thankfully I still like that feel. 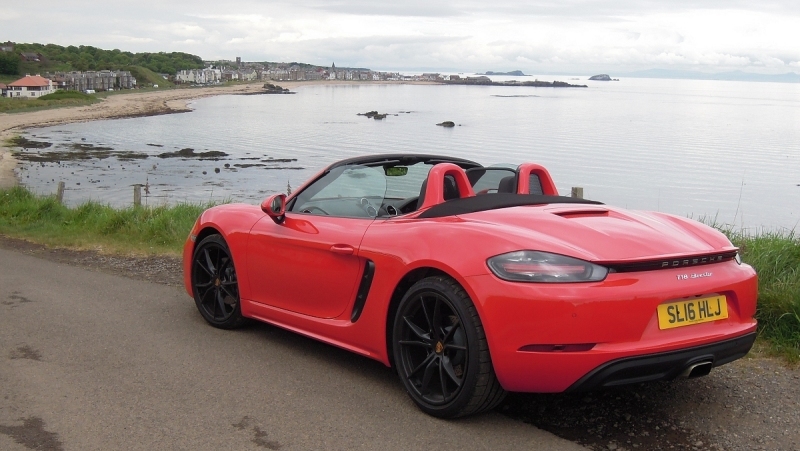 Is the new 718 better or worse? I’d say it is neither, it is simply what the market expects today; more power, less fuel, more toys and at a barely increased price from what I paid 10 years ago it actually represent better value too. What’s not to like? Reflecting on the comparison between the old 6 and the new 4 hasn’t really troubled me, but another comparison has got me thinking. 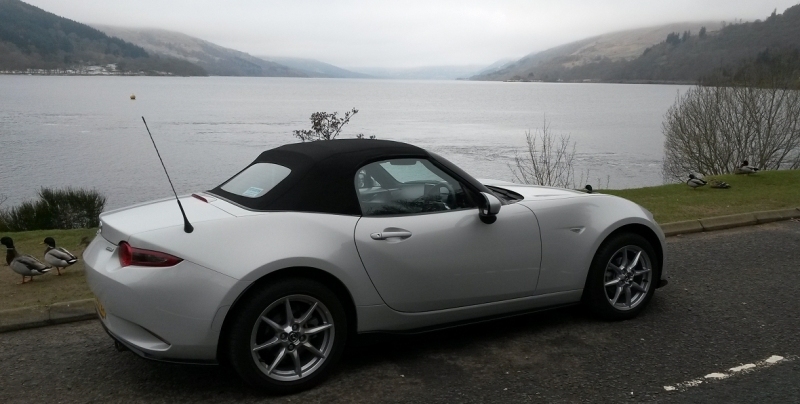 I recently spent a day with the new Mazda MX5 Mk4, which I absolutely adored. For sure, in every measurable respect the 718 wipes the floor with the MX5; more power, more speed, more grip, better built, etc, but I can’t help wonder in which car I had more fun on the road. Mazda’s approach to downsizing their sports car is very different to Porsche’s in that it is small light and minimal. I found I could use more of the performance of the car, more of the time, without endangering my driving licence, and I had a ball driving it pretty hard. I have to confess that I did not drive the 718 anything like as hard, as to do so I would have been doing pretty anti-social speeds, and we all know the consequence of that these days. Add to the equation that the Mazda is half the price of the Porsche and to me at least there is no doubt that in fun per pound, the Mazda makes more sense on today’s crowded roads. So the real elephant in the room for me is not the loss of two cylinders. Of the six Porsches I have owned to date, four of them have been 4 cylinder cars, so I have no problem with the idea of a turbo 4 Porsche, especially not one as blindingly good as the new 718. Nope, my personal elephant is the fact that yet again Porsche have ignored the market segment below the Boxster, and have given us another larger, faster car than the original rather neater Boxster. Herr Porsche, can you now really go back to your roots and build me a proper small sports car in the vein of the 356, but brought bang up to date. And frankly I don’t care how many cylinders it has!